Mirchi is a mass action romance revenge saga, offering few surprises in the story but with great casting and some solid performances. Writer/director Koratala Siva gets bogged down in a long flashback and loses the momentum a bit towards the second half, but generally moves along at a reasonable clip from fight to song to romance to fight and back again. Like many mass films, it starts light and fluffy but then the body count starts to rise so you do need to be a bit gore tolerant to fully enjoy Mirchi. Jai (Prabhas) is an architect in Milan. He meets Manasa (Richa Gangopadhyay) and saves her from some thugs. They become friendly and he learns of her family – dominated by a violent assortment of men living in a big old house – and Jai decides to fix her life. Of course, Jai has an ulterior motive for wanting to reform her family, and that is revealed through a very long and detailed flashback. Jai is the son of Manasa’s family’s enemy, Deva (Sathyaraj). How can Jai reform her family, reclaim his place with his own estranged family, eliminate any enemies who refuse to comply and oh yes – what will happen to Manasa when he is reunited with his first love, Vennela (Anushka Shetty)? Prabhas is made for this kind of role. Jai is a nice guy, although of course he can kill evil doers with a single blow. Prabhas has such a likeable screen persona and the action scenes are well within his capability. He has nice chemistry with both leading ladies although as the story unfurls there is little ambiguity about who he would choose. There is not a lot of complexity or nuance, but the role contains enough variety to give Prabhas a bit to work with. Jai does have to find a way that doesn’t totally rely on revenge and violence so there is a clear before and after in his character. One of the highlights is the slightly more prominent roles given to some supporting actors, and those scenes give Prabhas more scope for lighter moments. Jai’s relationship with his father is played out nicely too, showing the slightly more sympathetic side of the feud. Favourite That Guy Subbaraju is Manasa’s brother. He is first seen pursuing some unfortunate bloke through college and delivering a serious beating. But Jai can see that apparently all he needed to give up his bullying ways was … discovering girls. Yes, Subbaraju got in touch with his sensitive side after dancing to Moves Like Jagger with the girl who fancied him. Who knew Maroon 5 was good for anything? But if that’s what it takes to get a good looking bloke to eschew dismemberment and take up flirting, well then I suppose that is not a bad thing. This dance outbreak also had the effect of making him dress better, pay his rent on time and generally improve his manners. From then on he spends the rest of the film on the phone to the girl, very coy and giggly as he mouths what I can only assume are dialogues along the line of ‘no you hang up…no you…no you hang up first’ and the like. Silly but amusing, and nice to see him in a slightly different role. Richa has a one note character so there isn’t much she can do with Manasa, although she and Prabhas have nice rapport and that helps make the growing friendship between the characters more credible. Once the terribly long flashback starts, she is sidelined and pretty much disappears until the last couple of minutes. Anushka gets more investment from the screenplay as the feisty village belle Vennela. She sets her cap at Jai and he happily succumbs, colourful dance numbers and all. Until disaster strikes on their wedding day. Sampath Raj has a prominent role as Manasa’s uncle, a nasty piece of work who bullies the entire household and believes he can heal his paralysed father by despatching selected enemies in front of him. Another That Guy, Adithya, plays Jai’s uncle, an old school type who believes in sorting out issues with a machete. Adithya doesn’t get the same opportunity to show off his acting range but he does get ample chance to flash a bit of leg. Supreet and Ajay make an appearance in the second half as muscle for Manasa’s family and the violence escalates towards a fairly brutal ending. Sathyaraj and Nadhiya are good as Jai’s estranged parents and there are lots of other familiar faces. Brahmanandam does his usual thing and luckily has minimal screen time in the latter section of the film where comedy would have been misplaced. His scenes had the audience howling with laughter, but as this was another Adventure Without Subtitles that all went over my head. Satyam Rajesh, Raghu Babu and others do what they do in a film that relies on ‘types’ more than on characters. The soundtrack is fun and the picturisations are sometimes spectacular (Darlingey and Mirchi in particular). Devi Sri Prasad seems to know his audience, and the crowd response to the songs was great. 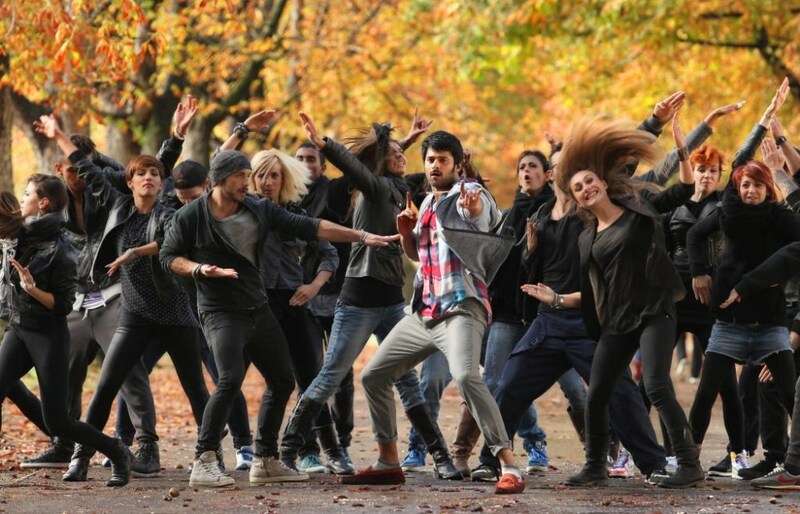 The choreographers generally concentrate on the possibilities afforded by Prabhas’ lanky frame and enormous wingspan. Despite what you may think based on that selection of images, Prabhas largely escaped the worst efforts of the blind costume designer, apart from one inexplicable t-shirt with braces attached. And there is an unwavering commitment to ugly acid wash denim throughout. But I do have to ask – the Keytar? Really design team? What were you thinking. Mirchi is a good formulaic timepass. It has a good cast delivering the minimal requirements of the script, along with well structured action and song sequences. If you’re a fan of Prabhas or the mass action genre, it’s well worth a watch. Plus if you like medical moments only possible in Indian films, then this is for you. This entry was posted in Tollywood and tagged Adithya, Adventures without subtitles, Ajay, Anushka Shetty, Brahmi!, Devi Sri Prasad, Koratala Siva, Mirchi, Nadhiya, Prabhas, Richa, Richa Gangopadhyay, Sampath Raj, Sathyaraj, Satyam Rajesh, Subbaraju, Supreet, Telugu, Tollywood. Bookmark the permalink.